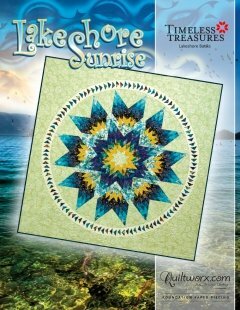 Lakeshore Sunrise, designed by Judy and Brad Niemeyer for Quiltworx. A sewing technique called foundation paper piecing is used to assemble the units required to make this quilt. Traditional piecing and curved piecing techniques are used to join the units after the foundation piecing is completed. Size 80" X 80".